Wife and I are incredibly impatient when it comes to navigating to files on the computer. We just can’t be bothered to navigate through several folders with who knows how many clicks. Lazy or efficient? You be the judge. It bugged us so much I wrote a Windows app to make keyboard navigation more instant. 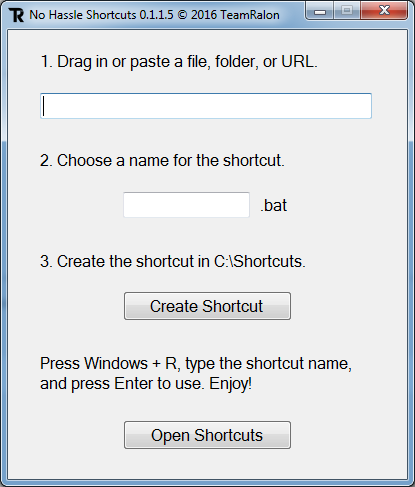 This app makes it easy to get to any file, folder, or URL with a few keystrokes. Do you go to a specific folder fairly often? Make a shortcut to it. Do you reference an obscure file every once in a while but don’t remember where it is? Do you hate trying to find a bookmark? Then make a shortcut to it. The app is called No Hassle Shortcuts. Download it by clicking here. Want to see the code? You can find it on GitHub.